What happens when you put your foot on the accelerator? The thing about being a start up is, you don’t know what you don’t know. Then, one day you wake up and realise there is a myriad of things you should know but don’t know where to go to know how to do the things you didn’t know you should know. Welcome to the world of accelerator programs. Cogniom has been lucky enough to have been accepted in to a number of programs, each offering something a little different, but all aiming to arm the cohort with the information needed to enable participants to be successful. First for us, there was Pitchblak which gave us the platform to create Cogniom. The CSIRO Biomed Launchpad instilled solid foundations for Cogniom to start growing and the experience provided the opportunity for our very first trial at Austin Health. Then, in August 2018 Cogniom joined the ranks at Impact Academy, where many social enterprise projects have walked through the doors. Focusing on the businesses that are looking to change the world for the better, we met some extraordinary people. industry. Today we are lucky enough to have her as one of our advisors, affectionately known as our team Mum. of the Innovation Centre with Mark Paddenburg at the helm. The network introductions, expert presentations and cohort support was overwhelming. Through all of this we enjoyed positive team growth to include some of the most experienced and inspiring mentors and advisors around. 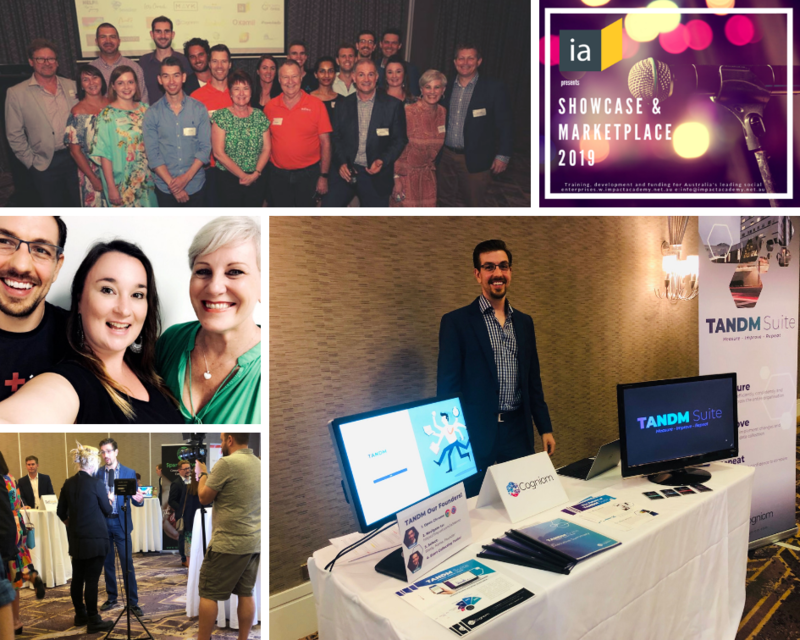 We’ve also been presented with some incredible opportunities to trial with leading health facilities, created exciting strategic business partnerships and experienced a solid pivot from our original idea to the TANDM Suite, because what is a good start up story without a solid pivot! Each of these accelerators ended with a pitch event, and I think it’s safe to say that our pitching efforts during Impact Academy and AH-x were by far the best. From the experience of pitch writing mentors to the amazing vocal coaching expertise of Aurelie Roque, Robert was more ready than ever before. One might even say pitch perfect… just, less the acapella backing vocals. And while we may not have had back up singers, we did have a live demo. Check out Cogniom vs the live demo here! In all honesty, it was the culmination of incredible hard work to get TANDM to where it is today. During pitch development sessions, we created a Time and Motion study to use on pitch presentations. We attended start up weekends and ran the study on their final presentations, we ran the study during practice sessions with our cohort and we ran it on Robert. 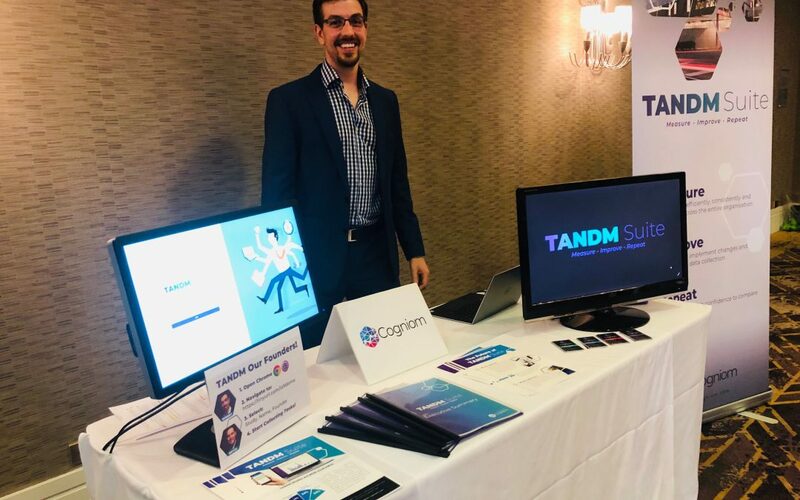 As we watched the data stream through, helped others understand the pitch presentation process and witnessed Robert’s own pitching talents grow exponentially after using the data to continuously improve, it was an exciting moment of validation that the TANDM Suite works. But, don’t take our word for it. (you’ll get that reference soon enough!) 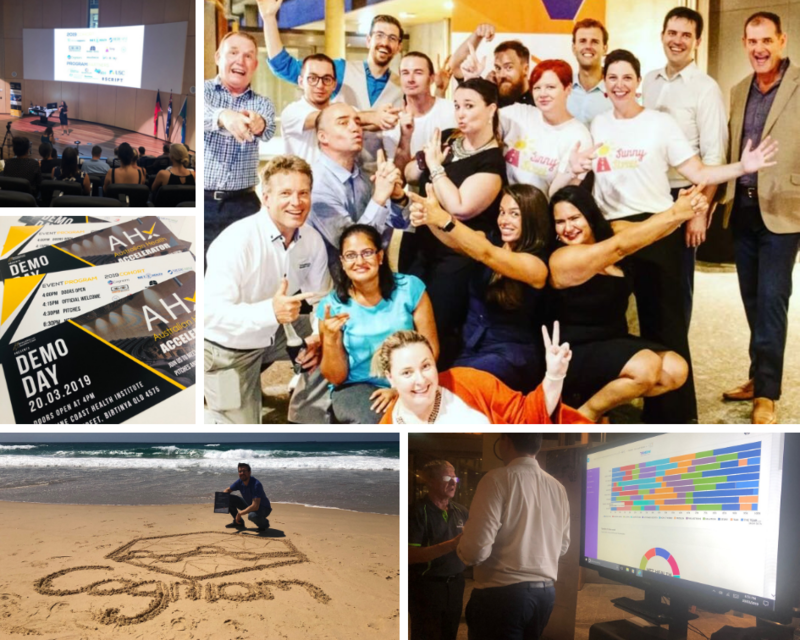 check out Robert’s pitch from the AH-x Demo Day at the Sunshine Coast University Hospital. Not even Internet Explorer could foil our plans of a successful TANDM Demo! As we move away from start up status and continue into growth and future projects, we can do so KNOWING we are armed with the extensive information provided from these powerful accelerator programs. Most importantly we’ve also learned how vital it is to surround yourself with likeminded people. People who understand what this journey feels like, whether it be because they’ve been where you are, or are literally standing next to you. Network is everything. Support comes from all walks and even if you are a lone founder, you don’t have to be alone in the journey. The beautiful thing we know now is improvement is a forever journey. Whether it be in business, in sports, in life or personal development, there is always something new to learn and grow from. How does the saying go? “Feel the fear and do it anyway”. No truer word is spoken in the start up world, but how reassuring it is to know there are people and programs to help you through. Finally, a massive shout out to the cohort from both Impact Academy and AH-x for having us be part of your journey, as well as joining us on ours. May your future shine as brightly as each of you do. If you’d like to find about more about how the TANDM Suite could benefit you, click on the button to book your demo.